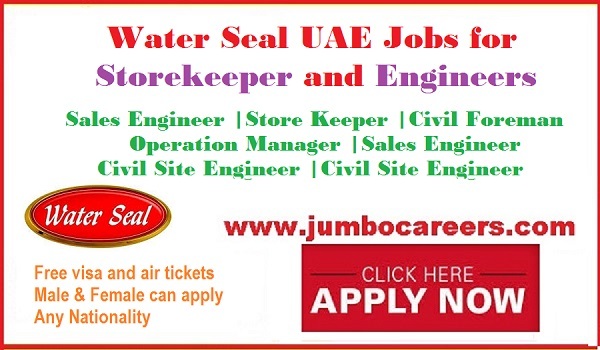 Water Seal UAE is hiring staff including Store Keeper, Engineers and foreman urgently. Benefits include free visa and air tickets. About the Company : Water Seal – a waterproofing company and contractor was established in early 90’s as the construction group through which Water Seal has access to the latest development in the industry with the support of advance computerized design and state of art engineering facilities ensuring commercial and technical approach to all the projects. The Sharjah branch was then established in 1998 while Dubai branch was established in 2000 and within one decade Water Seal stands as one of the leading waterproofing organizations in the UAE. How to apply for jobs at Water Seal UAE? Store keeper jobs at Water seal UAE. Engineers jobs at Water seal UAE.